El día mundial contra el cáncer está iniciando conversaciones y provocando un diálogo más profundo sobre los problemas más críticos relacionados con el cáncer en todo el mundo. Lunes, 4 de febrero – El Día Mundial contra el Cáncer de 2019 señala la necesidad de tomar medidas urgentes para potenciar la detección, el cribado y el diagnóstico del cáncer en sus fases iniciales con el fin de mejorar significativamente las probabilidades de sobrevivir de los pacientes con cáncer. Bajo el lema «Yo Soy y Voy A», el Día Mundial contra el Cáncer, liderado por la Unión Internacional Contra el Cáncer (UICC), pretende incitar a las personas, a la comunidad de la salud y a los gobiernos a aumentar la concienciación pública y el acceso a la detección temprana, al cribado y al diagnóstico. 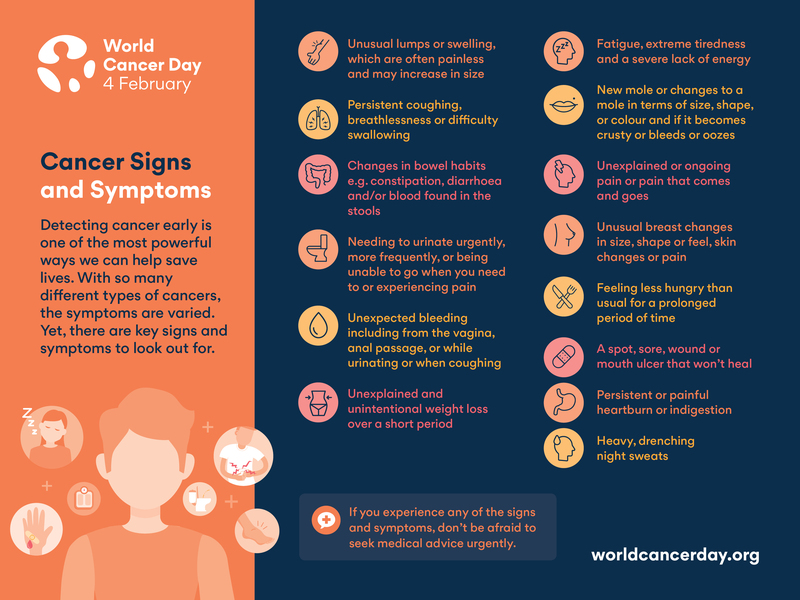 Monday 4 February 2019 – World Cancer Day: Leading musicians have come together for this World Cancer Day – a global awareness raising initiative by the Union for International Cancer Control - joining the global campaign to boost public health awareness and action against cancer. In a bold, emotional and inspiring video montage marking the day, artists including Grammy winner Alessia Cara and TIME 100 Most Influential People of 2018 honouree Shawn Mendes, as well as luminary will.i.am, Billboard’s Hot 100 chart topper Halsey, singer, songwriter and actress Sabrina Carpenter and Chinese-Canadian superstar Kris Wu share their support and commitment. Cancer survivors Taboo, rapper and member of Black Eyed Peas, and the visionary Nile Rodgers also participate alongside Puerto Rico’s record breaker Luis Fonsi, whose long-time friend and former publicist was diagnosed with breast cancer. World Cancer Day’s 2019-2021 campaign theme is ‘I Am and I Will’, an empowering call for personal commitment and action taken now to reduce the growing burden of cancer. Kicking off the first year of the new campaign, artists from around the world took the opportunity to show their support by committing to inspire action in their own lives and the lives of those around them. 31 JANUARY, Kumasi, Ghana – On the occasion of World Cancer Day, a global initiative of the Union for International Cancer Control (UICC), HRH Princess Dina Mired of Jordan, will make her first official visit to Africa as President of UICC from 2 – 6 February. Today on World Cancer Day, Cancer Australia has released national data on cancer survival by stage at diagnosis* for colorectal (or bowel) cancer, which shows five-year survival is 99% if detected at stage 1. Under the theme of ‘I Am and I Will’ World Cancer Day 2019 highlights the need for early stage cancer detection to significantly improve cancer patients’ chances of survival. World Cancer Day aims to save millions of preventable deaths each year. Madrid, 01 de febrero de 2019.- Con motivo del Día Mundial contra el Cáncer, que se celebra el 4 de febrero, la Federación Española de Cáncer de Mama (FECMA) y las 45 Asociaciones de Mujeres con Cáncer de Mama que la integran y que son parte activa del movimiento asociativo de pacientes, se unen a la campaña “World Cancer Day”, de la Unión Internacional Contra el Cáncer (UICC), de la que forma parte nuestra Federación, bajo el lema “Yo Soy y Voy A”, para reducir la carga global que representa esta enfermedad, promover una mayor equidad y asegurar que el control del cáncer sigue siendo una prioridad en la agenda mundial de salud y desarrollo. PLYMOUTH MEETING, PA [February 4, 2019]—The National Comprehensive Cancer Network® (NCCN®) announces formal endorsements from the governments of Ethiopia, Nigeria, and Tanzania for the NCCN Harmonized GuidelinesTM for Sub-Saharan Africa, while joining cancer leaders across the globe to raise awareness and take action for World Cancer Day on February 4. Singapore, 28 January 2019: Singapore Cancer Society (SCS) commemorates World Cancer Day this year with the support from over 30 organisations who have come forward to pledge their commitment to raise greater awareness, support the community, and fight against cancer. Today, City of Joburg in partnership with PinkDrive commemorated World Cancer Day by providing health screening to residents of Alexandra, East of Johannesburg. The event mobilised and empowered residents of East bank and surrounding communities with knowledge around cancer as well as screening opportunities. Berne – 22 janvier 2019 - Avec sa campagne sur les réseaux sociaux, la Ligue contre le cancer encourage à bouger. Les personnes atteintes d’un cancer peuvent déjà bénéficier des bienfaits d’une activité physique pendant la thérapie et la phase de réadaptation. À l’occasion de la Journée mondiale contre le cancer, et en partenariat avec des associations et organisations sportives régionales et nationales, la Ligue contre le cancer incite les gens à bouger plus. En effet, le mouvement permet de prévenir cette maladie et d’en réduire les effets indésirables. Lyon, France, 4 February 2019 – The latest figures from the International Agency for Research on Cancer (IARC) show that an estimated 570 000 new cases of cervical cancer were diagnosed worldwide in 2018, making it the fourth most common cancer in women globally. Every year more than 310 000 women die from this preventable disease, and about 90% of these deaths occur in low- and middle- income countries (LMICs). Icon Cancer Centre Hobart has delivered its first stereotactic radiation therapy (SRT) treatment, an advanced technique used to treat, small well-defined brain tumours, including tumours that have spread from a primary cancer. The centre is the first oncology care provider in Tasmania to apply this precision treatment technique to brain tumours. A Dalby patient has become the 200th person to receive treatment on Australasia’s first Varian Halcyon system at the Radiation Oncology Centre (ROC) in Toowoomba. The Halcyon system is the latest in radiation therapy technology and was installed at ROC in October 2017. On World Cancer Day, the machine has treated over 200 patients, and delivered more than 5,800 treatments. The machine has the capacity to treat up to 50 patients a day and its pioneering technology simplifies every aspect of treatment, to deliver pinpoint precision and speed, alongside providing greater comfort to patients. Since opening at the beginning of 2018, Icon Cancer Centre has brought comprehensive, cutting-edge cancer care to Mackay’s backyard and has saved patients and their families over 355,000 kilometres of travel; that’s equivalent to 22 trips around Australia. A new treatment technique at Icon Cancer Centre in Rockingham is protecting patient’s hearts from radiation doses during left-sided breast cancer treatment. “Merck More than a Mother” supports infertile women through access to information, health and change of mindset. “Merck STEM Program for Women and Girls” starts today in Kenya. Merck inaugurates “OLYMPIC School” where they equipped the library with a computer lab as part of their program “STEM for Women and Girls” in Africa. Nairobi, Kenya, March 3, 2017 – Merck, a leading science and technology company, today announces their commitment to empower Kenyan women through their” Merck More than a Mother “and the start of “Merck STEM for Women and Girls” programs. New phase of the SPARC MBC Challenge aims to expand the reach of the programme to 10 additional organisations, bringing the total to 50 cancer organisations in countries around the world, including India, Canada, Mexico, Brazil, Argentina, Greece, Australia and Nigeria, among others. Geneva (Switzerland), February 4, 2019 – In conjunction with World Cancer Day, the Union for International Cancer Control (UICC) and Pfizer Inc. announce the third round of the Seeding Progress And Resources for the Cancer Community (SPARC): Metastatic Breast Cancer (MBC) Challenge: their pioneering grants initiative designed to support the implementation of projects worldwide that address the specific needs of women with metastatic breast cancer in local communities – many of which extend beyond treatment. Caudete (España), El Lunes, 4 de febrero, Día Mundial contra el Cáncer 2019, señala la necesidad de tomar medidas urgentes para potenciar la detección, el cribado y el diagnóstico del cáncer en sus fases iniciales con el fin de mejorar significativamente las probabilidades de sobrevivir de los pacientes con cáncer. Bajo el lema «Yo Soy y Voy A», el Día Mundial contra el Cáncer, liderado por la Unión Internacional Contra el Cáncer (UICC), pretende incitar a las personas, a la comunidad de la salud y a los gobiernos a aumentar la concienciación pública y el acceso a la detección temprana, al cribado y al diagnóstico. World Cancer Day отмечается с 2005 года по инициативе Союза международного контроля над раком (UICC) при поддержке Организации Объединенных наций, Всемирной организации здравоохранения и Международного агентства по изучению рака. 4 febbraio 2019, Giornata Mondiale contro il Cancro – Il 4 febbraio è la Giornata Mondiale contro il Cancro e anche AFRON Oncologia per l’Africa Onlus intende far sentire la sua voce. Obiettivo di questa giornata è quello di attirare l’attenzione sulla seconda causa principale di mortalità a livello globale. OTTAWA (January 4, 2019) – The Canadian Nuclear Association (CNA) is marking World Cancer Day by highlighting the important role nuclear technology plays in diagnosing and treating cancer. On World Cancer Day, millions are urged to get active to help combat one of the world’s most deadly diseases. But every day, nuclear is on the frontlines in the battle against cancer. “Canada has been a pioneer in the development of radioisotopes, saving millions of lives around the globe for over six decades in more than 80 countries,” said CNA President and CEO John Barrett. “Since the 1940s, our nuclear industry has demonstrated world-class nuclear expertise and achievements, leading to significant advancements in medical imaging, cancer therapy, and diagnostic development. As part of its continuous cancer awareness and health advocacy initiatives in Kuwait, Fadia Survive & Thrive Cancer Association proudly organized ‘Together we are Unstoppable in fighting Cancer: I Am and I Can’ awareness event and workshop dedicated to the World Cancer Day on February 4, 2019. World Cancer Day is an initiative of the Union for International Cancer Control, the largest and oldest international cancer organization committed to taking the lead in uniting the cancer community to reduce the global cancer burden. Saturday 3 February 2018 – World Cancer Day: On Sunday 4 February, World Cancer Day raises awareness of the millions of people world-wide facing unequal access to cancer detection, treatment, and care services. With cancer leaders, health professionals and supporters across the world pushing for urgent action to reduce the rate of premature cancer deaths globally, the day calls for diagnostic and treatment access to be prioritised.